I saw this when I was at Michaels the other day, but forgot to take a photo. I borrowed this one from another Pea named BENITA, an inspirational lady with a sister dealing with cancer, who she talks about HERE. Benita says 50 cents of each purchase goes to breast cancer research. I already have the orange “X” Xyron. It was actually one of my first ever scrapbooking purchases, lo those many years ago. I use it all the time for getting adhesive on the back of those tricky Cricut letters. But even though I don’t “need” a pink one, I’ve decided to get one the next time I’m at Mike’s. It’s for a wonderful cause, right? I’m hearing good reviews of them, too. I noticed the slot on top is smaller and I thought that would be a bad thing, but apparently not….just listen to what the Peas say HERE and HERE. One poster said that it’s exclusive to Mike’s for one month, then will be available wherever Xyron products are sold. Even though this pink “X” just showed up at my Michaels, it has been seen at other ones since early August (so start looking for it in other stores, too). If you don’t “need” one why not donate the money you would have used to purchase the Xyron and donate it to cancer research. That way you aren’t purchasing something you don’t really need and cancer research will end up with a much bigger donation. Just a thought. Oh, NO!!! LOL! I have a red one and a pink sparkly one…both of which were purchased for the color! HA! I keep repo in one and perm. in the other. I had two orange ones – my first one ever and one that came in a kit with a bunch of other stuff and it was cheaper to get the kit than to buy the other stuff without the ‘x’. SO…I have, in my lifetime, had four of these silly things and now I want this one, too! LOL! I think I may have a problem! HA! Super cute AND pink….what could be better?! Do you know how long the sticky in those lasts? I’ve had mine for about 4 years now and actually forgot I had it. I wonder if it still works? 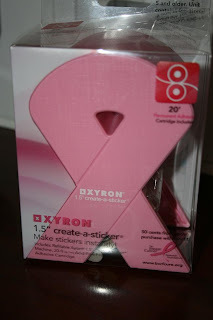 The Xyron X goes pink ribbon. But definitely for a great cause.